Journey Below Area 51While the glory days of the government's operating location at Groom Lake are past, Bryan O paints a vivid picture of the installation's rise and relevance in the evolution of fringe sciences, and will stir debate with his depiction of a new, heavily shrouded spaceport in the Rockies. 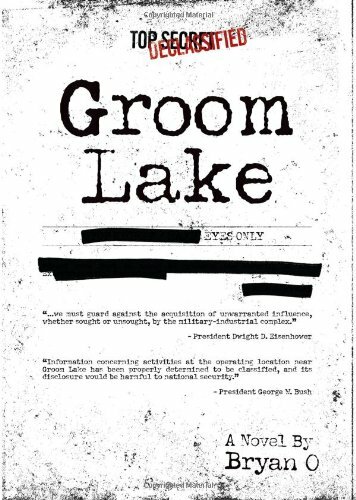 Groom Lake is not just a novel; the narrative is a briefing on America's black budget programs and practices. The story gives a historical account of shadow government activities, methods and reasoning, intertwined with a fast-paced plot where intelligence agents guard their fringe programs from inquisitive civilians, China's Ministry of State Security and a congressional task force investigating black budget spending. Bryan leaves readers wondering if the book is truly fiction, or if he is possibly a ghostwriter for the government in a top secret program called Project Meshing that is intended to raise public consciousness about certain fringe sciences. <b>Author's Question:</b>Can a novel be an effective tool for distributing information? *****There are artistic license advantages to presenting fact as fiction that would otherwise be unacceptable in a non-fiction book, buy why use fiction to present facts? What if the government had decades of mounting secrets and the individuals in charge finally decided it was time to change the directives and make this information known? Certainly a press conference followed by a special-interest-backed congressional feeding frenzy for control of the new information would not serve the public's best interest. One logical approach might be to disperse the information slowly, using various media outlets that remove the shock value and ease acceptance through a methodical heightened awareness. *****A letter at the beginning of <i>Groom Lake</i> is addressed to me as ghostwriter for the character spearheading this story. The challenge presented is discerning if I fabricated the letter for the story, or if the letter, and the novel, were contrived as part of a larger purpose. Regardless of the verdict, readers will finish this book with a heightened awareness of practices and fringe sciences controlled by government factions.